For the last in our series of exhibitions exploring the status of painting today, held at Handel Street Projects during 2018, we are pleased to present a new body of work by German artist Stefan Sehler. With these new works, almost looking like large-format photographs, virtual photorealist representations of abstract paintings, Sehler keeps questioning our preconceived ideas about the medium of painting and materials and techniques he is deploying. The central point of this work revolves around surface, reality and illusion. 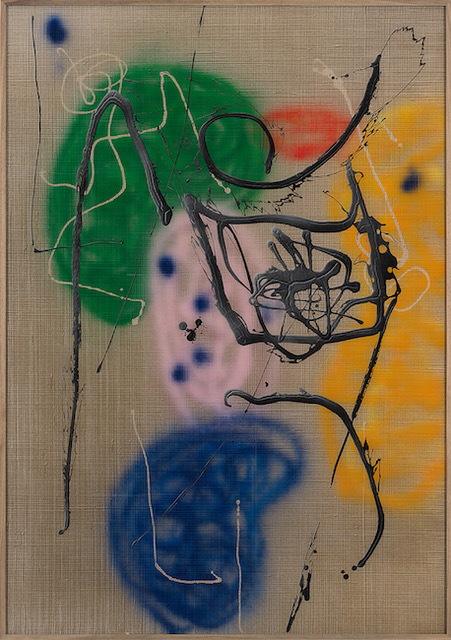 Over the years, Sehler has been constantly reinventing a very unusual process of ‘making’ the painting on the back of Perspex, using mixtures of oils, enamels and acrylics so that otherwise textured surface is hidden, refusing the painting this constitutive feature and depriving the viewer of the tentative eye. These ‘surrogate’ paintings are a play between abstraction and figuration, they use controlled chance, where in the artist’s own words: ‘paint does things its own way’, and they also show and reflect the act of doing/making the painting itself and its material. This technique makes the surface look suspended within it, distancing itself from the viewer. Sehler’s usual motifs of flowers, trees, branches, foliage and mountain ranges (not representations as such) are substituted here with complete abstractions, or are they? The result is an ongoing game of deception between different layers of medial representation, a dialogue between painting as action or conception, between image and reproduction. Sehler calls them: ‘Memories of paintings, that have not been painted yet’. Do we see liberal spills of paint on top of intrinsic structured background reminiscent of sheets of fabric (or indeed, a painters canvas) as an abstraction? What is it that lies ‘behind’ illusion of the physical object? We could think here about the historic 18th century German Hinterglasmalerei, reverse painting on glass and more recently Gerhard Richter’s mirror paintings, but Sehler’s opus certainly stands as pioneering. As Donald Kuspit pointed out writing about Sehler’s work in Artforum: ‘These captivating paintings demonstrate that modernist painting is not necessarily dead – it still has some tricks up its sleeve – and show that a quasi – photorealist picture can have a message every bit as striking as the dazzling technique it employs’. Stefan Sehler (born 1958, Nurnberg) studied at the Kunstakademie Dusseldorf under Professopr Gunther Uecker. His works are in many private and public collections including Collection Sandretto Re Rebaudengo, Deuche Bank Collection, The Foundation Louis Vuitton, Musse d’Art moderne et d’Art contemporain de Nice and Kunstmuseum Dusseldorf. He lives and works in Berlin.